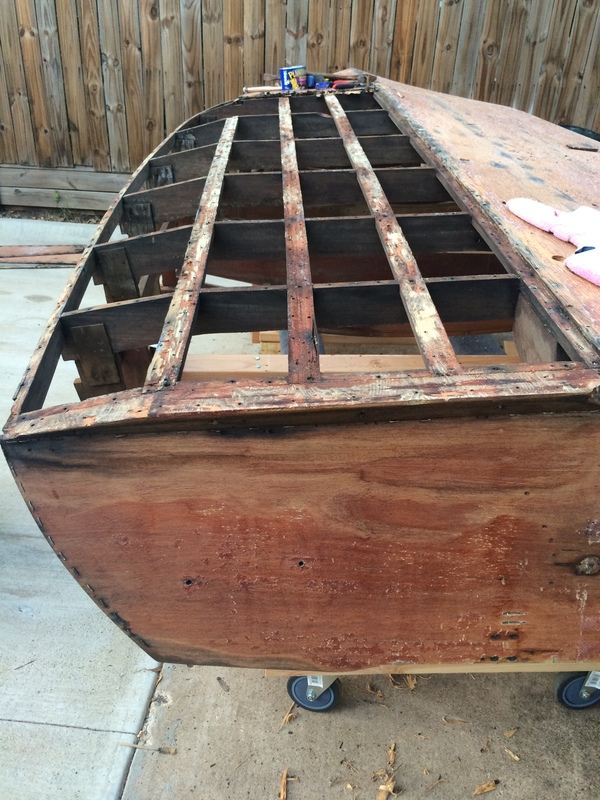 For the last week I have been working on removing the plywood hull bottom from my 1948 Speed Liner. 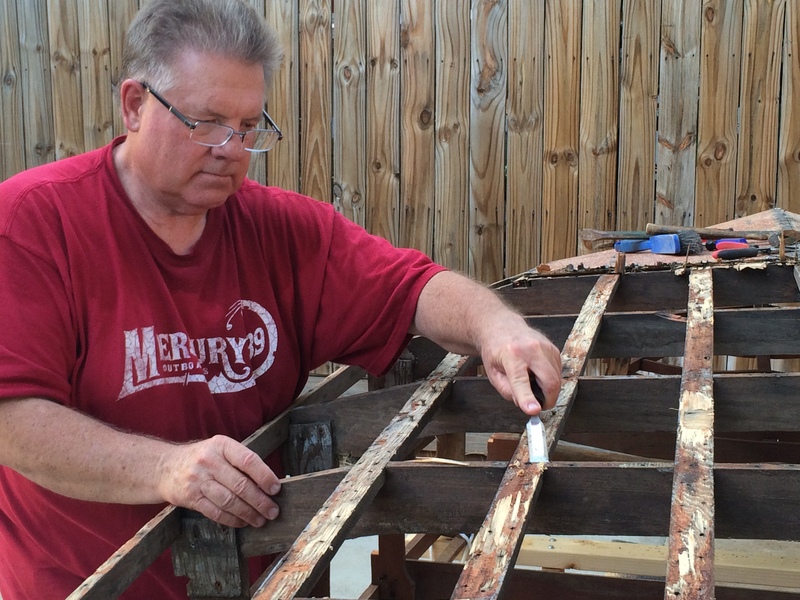 As with nearly all the tasks associated with restoring these old wooden boats, it has been an arduous task. There are literally thousands of screws that have to be found, dug out, and unscrewed. Of course, very few of them come out cooperatively. Nearly all of them are a combat. Plus, you can bend over that hull for only so long until you realize that you are actually going to have to climb up on top of it in order to be able to reach all the screws. I feel compelled to remind you that when working with a hull bottom that has been fiberglassed, it is absolutely imperative to have an old towel to sit on. Trust me. You will be sorry if you don’t. Since I started on this project of removing the old hull bottom, every night I go to bed with fiberglass shards embedded all up and down my forearms. It is not a pleasant condition and certainly not one conducive to sleep. 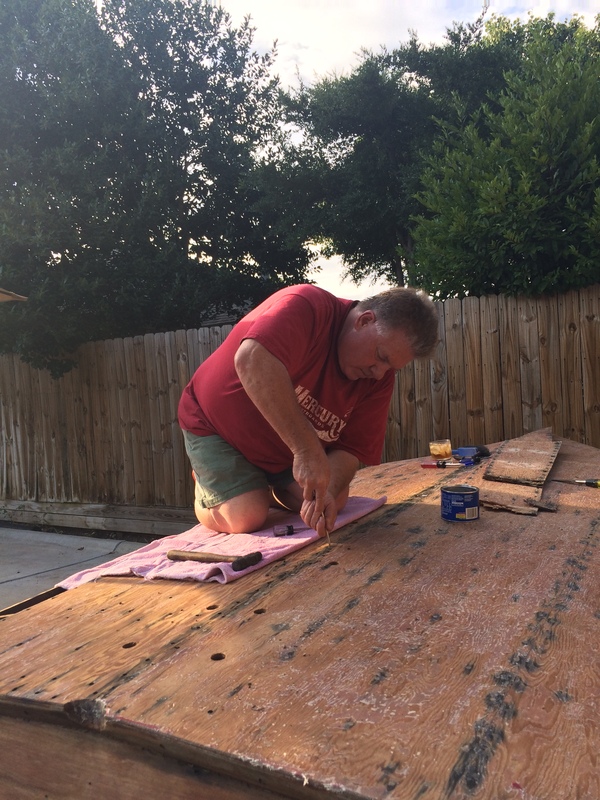 Once I had all the screws removed, or at least all those that were going to come out cooperatively, I took my trusty crow bar and gently pried up the plywood hull bottom from where it was fastened to the frames and bottom battens. Unfortunately, in that process I happened to break one of the bottom battens, and so I will have to replace that. That’s not that bad, really; I was actually expecting to break more. After removing each section of the plywood hull bottom I took a sharp chisel and scraped all the remnant plywood from the battens and frames. Later I will fill the screw holes with wooden match sticks and sand them smooth in preparation for painting. We’re coming along steadily, if not slowly. Tomorrow I will remove the bow section of the hull bottom and start on the port side. Clearly, this is going to take a while. Patience and perseverance are the keys. By the way, I heard a great new country western song on the radio this week. It’s called, “Buy Me a Boat” by Chris Janson. My favorite line says, “I know everybody says money can’t buy happiness, but it could buy me a boat. It could buy me a truck to pull it.” Awesome! I love it. This is going to become my new theme song.